Using Galleon Atomic Radio Clocks or GPS Precision Clocks you can synchronize your computers time to the most accurate clock in the world. NTP drivers convert any Windows NT/2000/2003/XP PC into a stratum 1 NTP network time server. Just plug into free serial (RS232) port on PC. See NTP Network Client Software for network client time synchronization. Weather-proof IP65 Antenna, can be wall mounted, outdoors, if required. 100 meters maximum cable length (5 meters supplied). 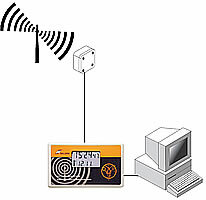 On-screen signal strength for fine-tuning antenna location. Dedicated Stratum 1 NTP server for network time synchronization. Can accurately synchronise the time on any number of NTP or SNTP compatible clients including: Windows 95, 98, ME, NT, 2000,2003, XP,Novell 5 & 6, UNIX and CISCO Routers and Hubs. Advanced Global Positioning System (GPS) Precision Clock. Mains powered, no batteries required. 1000 meters maximum cable length. NTP network client software to synchronize time clients across network. 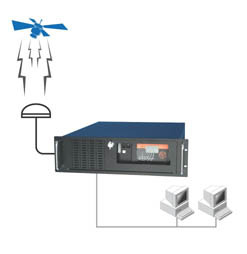 Operates in either unicast or broadcast NTP modes. Can synchronize to multiple NTP time servers providing built-in redundancy. Provides full audit log of time adjustments. Windows 95/98/Me and NT/2000/2003/XP clients supplied. A 3 Year warranty is provided on all products from date of purchase on a return to Galleon basis. At Galleon we believe the highest level of technical support should be available FREE of charge. Our technicians will endeavor to solve any problems you may have. Terms and conditions of sale available on request.